Roofing Contractor in Frisco TX? ⋄ You should expect that they be honest and trustworthy. ⋄ You should expect that they be professional at all times. ⋄ You should expect that they be very dependable and work promptly. ⋄ You should expect that they provide you with a detailed price quote. ⋄ You should expect that they will complete the job in a reasonable period of time. ⋄ You should expect that they will provide a written guarantee of their work for a specified period of time – usually no less than 1 year from date of completion. You should also want them to have expertise in every kind of roofing job – they should be aware of the fact that you aren’t a pro in roofing and be able to explain everything to you in layman’s terms. With their experience, they should be able to give you suggestions on what type of roof and roof material you would need for your repair, replacement, or installation project. They need to earn your respect and trust, especially when it comes to the safety, lifespan, and price of the service they provide. In short, you should be able to expect that you get the highest quality workmanship at a reasonable price with excellent customer service by your selected Roofing Contractor in Frisco TX. 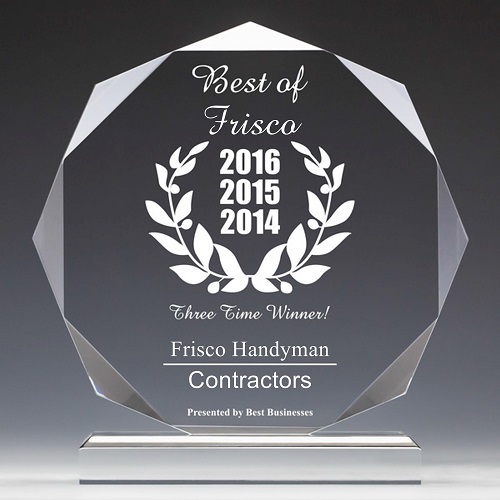 Frisco Handyman is a roofing contractor in Frisco TX that strives to meet all of the above criteria, and much more.